So as you can see, being a dapper dude doesn't require that much effort. 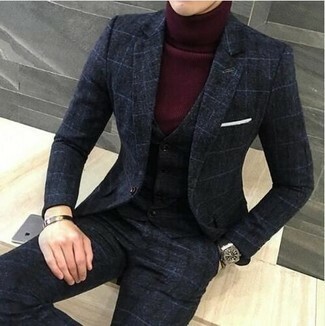 Just try pairing a Topman jersey turtleneck long sleeve t shirt from Nordstrom with navy vertical striped dress pants and you'll look incredibly stylish. 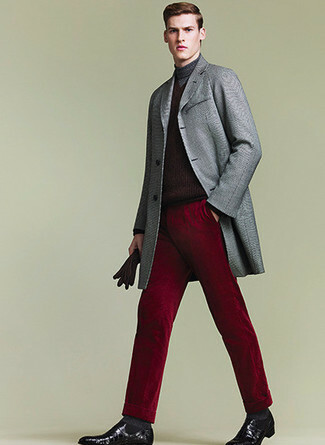 Wear a burgundy turtleneck and burgundy dress pants like a true gent. When it comes to footwear, this look is finished off nicely with black leather chelsea boots. 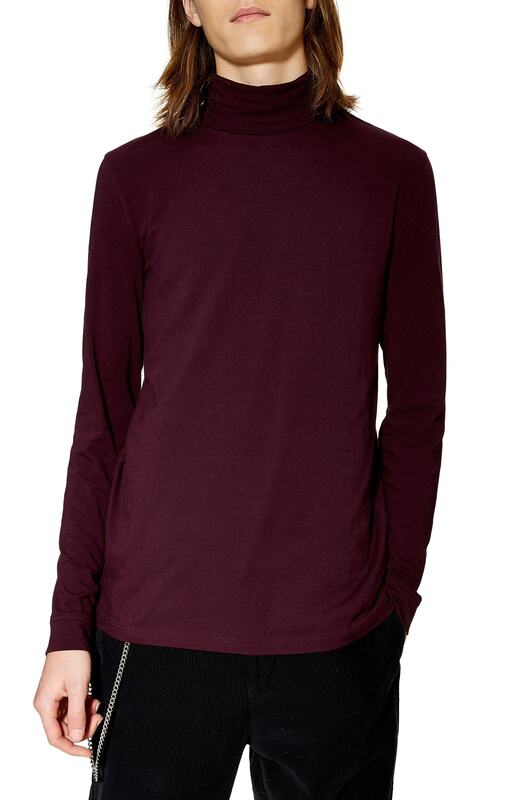 If you're looking for a casual yet on-trend outfit, consider teaming a burgundy turtleneck with black skinny jeans. Both items are totally comfortable and will look great together. Tap into some David Gandy dapperness and complete your ensemble with dark brown leather chelsea boots. 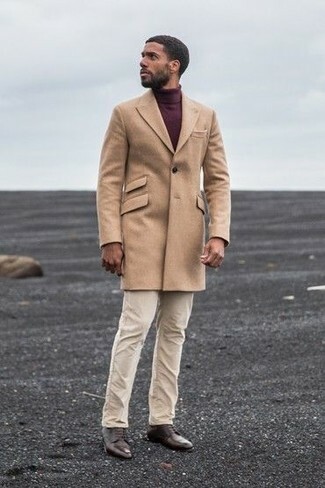 Team a Topman jersey turtleneck long sleeve t shirt with beige dress pants for incredibly stylish attire. 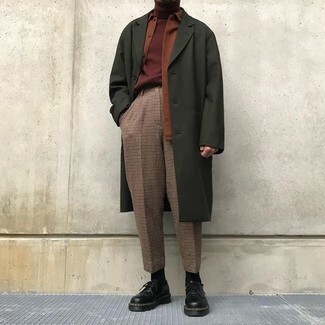 Look at how well this outfit is complemented with dark brown leather chelsea boots. 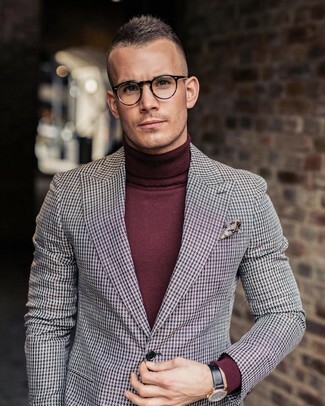 For a nothing less than incredibly stylish look, opt for a burgundy turtleneck and a charcoal check three piece suit. 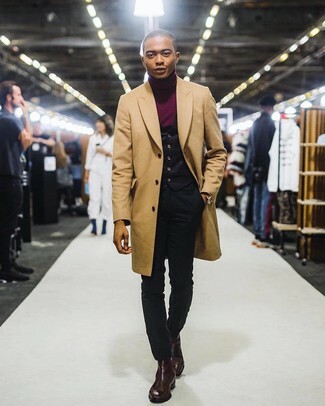 Make a burgundy turtleneck and a multi colored houndstooth blazer your outfit choice for relaxed sophistication with a manly take. If you're looking for a casual yet sharp look, try teaming a Topman jersey turtleneck long sleeve t shirt from Nordstrom with khaki chinos. Both pieces are totally comfortable and will look great together. A pair of dark brown leather casual boots adds more polish to your overall look. If you're on the lookout for a casual yet stylish ensemble, opt for a Topman jersey turtleneck long sleeve t shirt from Nordstrom and beige chinos. Both pieces are totally comfortable and will look great together. Up the cool of your outfit by completing it with dark brown leather derby shoes. 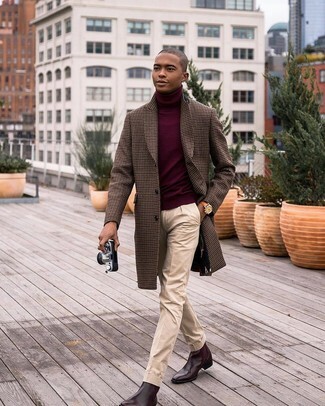 This pairing of a Topman jersey turtleneck long sleeve t shirt from Nordstrom and brown check dress pants is super easy to throw together in no time, helping you look awesome and ready for anything without spending a ton of time rummaging through your closet. When it comes to shoes, this ensemble pairs well with black leather derby shoes.